Two British soldiers were killed when attempting to defuse a bomb in Belfast. An RUC officer was killed in an IRA attack in Coalisland, County Tyrone. Two members of the Irish Republican Army (IRA) were killed when a bomb they were planting exploded prematurely in Dungannon, County Tyrone. 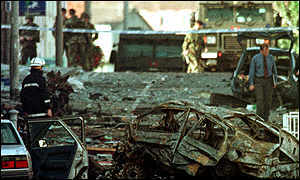 A Protestant civilian was killed in bomb explosion in Magherafelt, County Derry. Alan McCrum (11), a Protestant boy, was killed and 34 people injured when the Irish Republican Army (IRA) exploded a bomb in Bridge Street, Banbridge, County Down. An inadequate warning had been given. 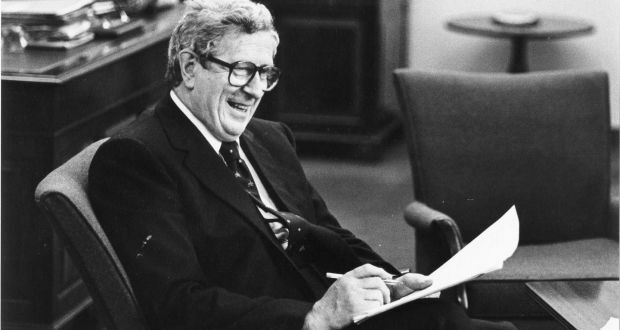 Garret FitzGerald, then Taoiseach (Irish Prime Minister), addressed the United States Congress and called on Americans to urge the British to accept the proposals that were emerging from the New Ireland Forum. Two men were shot dead by the Irish National Liberation Army (INLA) in Belfast. The Elected Authorities (Northern Ireland) Act became law. One of the requirements of the Act was that candidates standing in district council elections should sign a declaration that they would not express support for illegal organisations or acts of violence. The Ulster Democratic Party (UDP) announced that a delegation would be attending the St Patrick’s Day reception at the White House, Washington, despite the presence of Gerry Adams, then President of Sinn Féin (SF). David Keys (26), who had been charged with the murder of two friends at Poyntzpass, Co. Armagh, was found hanged in his cell at the Maze Prison. Both of Keys’ wrists were also slashed. At the time the RUC said that they were treating his death as murder. Rosemary Nelson, a Lurgan solicitor, was killed by a booby trap car bomb in Lurgan, County Armagh. Nelson had been driving away from her home in her BMW car at lunchtime when the explosion happened. 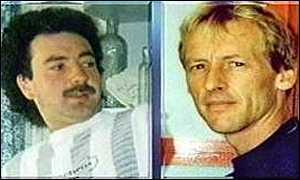 The Red Hand Defenders (RHD) claimed responsibility for the murder. [The fact that commercial explosives had been used in the bomb led some commentators to speculate that one of the mainstream Loyalist groups was involved in the killing. In the following years it became clear that the name RHD was being used as a cover name by both the Ulster Defence Association (UDA) and the Loyalist Volunteer Force (LVF). Loyalists carried out a petrol-bomb attack on the home of a ‘mixed-marriage’ family in Larne, County Antrim. There were no injuries as a result of the attack. The third recruitment drive for Police Service of Northern Ireland (PSNI) was started. Figures released showed that during the second campaign a total of 525 out of 3,500 applicants were from the Republic of Ireland. However a Ulster Unionist Party (UUP) member of the Police Board criticised the high numbers of Catholics joining from the Republic and said it masked a reluctance among local Catholics to join the new police service. Shot while on Royal Ulster Constabulary (RUC) mobile patrol, Brackaville Road, Coalisland, County Tyrone. Killed by booby trap bomb, hidden in abandoned car, Grosvenor Road, Belfast. Killed in bomb attack on his home, Circular Road, Jordanstown, Newtownabbey, County Antrim. Shot while walking along Ormeau Road, near Havelock Place, Belfast. Killed in lorry bomb explosion, Queen Street, Magherafelt, County Derry. Inadequate warning given. Shot while in Alexandra Bar, York Road, Belfast. Ulster Defence Association (UDA) / Ulster Volunteer Force (UVF) feud. Tube train driver. Shot shortly after bomb exploded prematurely on tube train, at West Ham Underground Station, London. Off duty. Shot near his home, Bellaghy, County Derry. Killed in car bomb explosion, Bridge Street, Banbridge, County Down. Inadequate warning given. Off duty reservist. Shot during ambush while driving his bread van, Tandragee Road, Newry, County Down. Found beaten to death at the rear of Boy’s Model School, off Ballysillan Road, Ballysillan, Belfast. Shot while travelling in car along Springhill Avenue, Ballymurphy, Belfast. Irish National Liberation Army / Irish People’s Liberation Organisation feud. Shot, at her home, Ashfield Gardens, Skegoneill, Belfast. Her relative the intended target. Internal Irish National Liberation Army dispute. 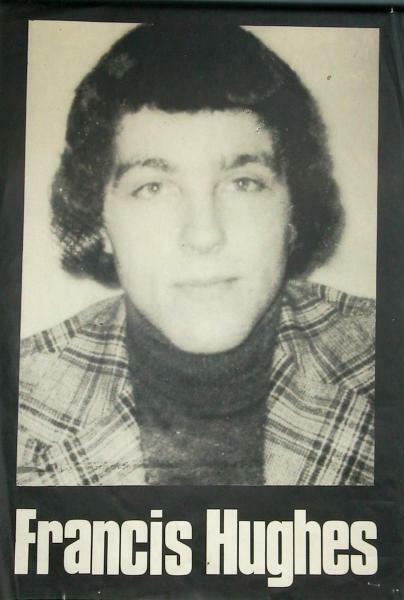 Found strangled in his cell, Long Kesh / Maze Prison, County Down. Internal Loyalist Volunteer Force (LVF) dispute. Lawyer. Killed by booby trap bomb attached to her car, which exploded shortly after leaving her home, while travelling along Ashford Grange, Lurgan, County Armagh.